One of the burning questions entering the 2014-15 season; who was going to score goals for the University of North Dakota hockey team? After giving up five goals in the first game of the season, and scoring only one, UND has gone on a tear. 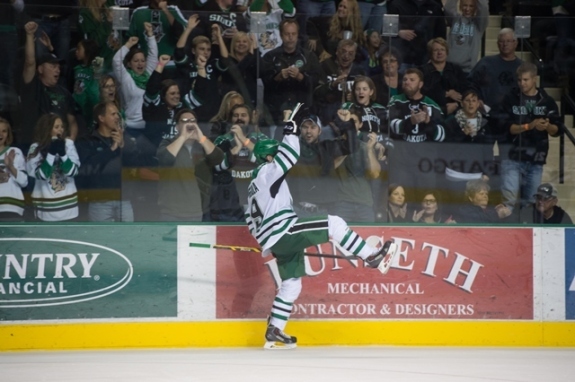 In the last four games – all wins – UND has scored 18 goals and given up only five. That’s a goal differential of +13. Leading the way for UND: Drake Caggiula (1g-6a—7pts), Mark MacMillan (5g-2a—7pts), Paul LaDue (3g-4a—7pts), Nick Schmaltz (1g-5a—6pts). Just for the sake of comparison, last season, UND was ranked 13th in the nation in goal scoring with 127 goals (3.02 Goals Per Game). After five games, UND is ranked second in the nation in goal scoring with 19 goals (3.80 Goals Per Game). After going 1-for-10 on the power-play the first weekend of the season, UND’s power-play has been explosive. Over the last three games, UND’s special teams have been firing on all cylinders, going 9-for-18 on the man advantage. Overall, UND’s power-play is ranked fifth in the nation (9/29, 31.6%). On the penalty kill UND has killed 26/30 opponent power-plays. While that stat isn’t overly impressive, UND has given up only one power-play goal in the last 12 penalty kills. Let’s break this down further, UND is ranked third nationally in goal scoring with 19 goals. Thirteen of those 19 goals have been scored on special teams (13/19, .684). Last season, UND scored four shorthanded goals. Through five games, UND has already equaled last season’s shorthanded goal total. Three of those shorthanded goals have come in the last two games. The UND penalty kill set the tone in their 6-1 victory over the fifth-ranked Providence College Friars. The Friars went 0-for-9 and gave up a shorthand goal. To date, there have been 27 shorthanded goals scored in division I college hockey. UND has scored four of them. On Friday night, UND forward Drake Caggiula scored a shorthanded goal at the 14:22 mark of the third period to give UND a 6-1 lead. After the game, Caggiula was asked why UND’s penalty kill is scoring so many shorthanded goals. UND forward Bryn Chyzyk loves to play on the penalty kill and also gave his reason why UND is scoring so many shorthanded goals early in the season. Lastly, while it’s early in the season, UND is cashing in on specials teams. If they continue to do this, they will be very successful this season.